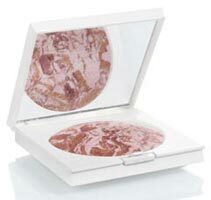 Glow on the double with 'Napoleon Perdis Blush Patrol' a unique pressed blush and bronzer compact with a three-hue swirl, that combines the latest baked and pressed powder technology to conveniently provide the dual use of wet or dry application. This 2 in one Blush & Bronze powder is state-of-the-art. It combines the latest baked and pressed powder technology to conveniently give you the dual use of wet and dry application. Sweep cheeks with bronzing brush while dry for a fresh and natural glow. Or very lightly wet the brush fr stronger contour and create a more intense bronze and beautiful glow. Contains the hero antioxidant for skin, Vitamin E - for soft and supple skin.